Dental implants are small titanium posts that are surgically placed in the jaw to act as artificial tooth roots. 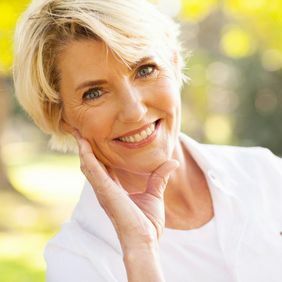 Once healed, implants can provide a lifetime of support for permanent crowns, bridges, or dentures, helping to restore the look and function of a smile with unparalleled strength and stability. Dr. Robert Astles has more than 15 years of experience performing dental implant procedures. If you are missing teeth, he can use dental implants and a custom restoration at his Vero Beach, FL, practice to create a beautiful new smile. Contact our practice today to schedule a consultation with Dr. Astles. Dr. Astles offers traditional, mini, and immediate-placement dental implants. Traditional implants offer the highest level of strength, durability, and support for restorations. However, in order to qualify for traditional implants, patients must have sufficient jawbone strength to support the implanted posts. Mini implants feature a smaller diameter, and were designed to provide an effective alternative for patients who do not qualify for traditional implants because of limited jawbone density. Finally, immediate implants allow Dr. Astles to place a permanent restoration after only a few weeks, rather than the several months of healing that is required with traditional implants. We design dental implants treatments around the unique needs of each patient. The number of implants you require depends upon the number of missing teeth and the type of restoration you will receive. While a single implant-supported crown requires one implant, dental bridges and dentures can often be supported by just a few strategically placed implants. To plan your treatment, Dr. Astles will use digital x-rays to evaluate jawbone strength and determine the ideal placement locations for each implant. After developing a personalized treatment plan, patients will typically undergo three main procedures: dental implant placement, abutment placement, and restoration placement. When you arrive to have your dental implants placed, Dr. Astles will first administer oral conscious sedation, which will put you in a state of "twilight sleep," but not complete unconsciousness. Once you are comfortable, he will create small incisions in your gums and place your implants directly in your jawbone. After the incisions are closed, the implants will be left to heal for several months. During this time, the implanted titanium posts will fuse with the surrounding bone through a process known as osseointegration. This process can prevent the bone loss that naturally occurs after losing a tooth, helping to improve your oral health. We can provide a temporary restoration for you to wear during this time. From the moment I step in the door I am treated with respect and a sense of care. My dentist is so very pleasant besides being very efficient.!!! The entire staff and Dr himself are very efficient. Its my pleasure to be a patient here! Once your implants have fused with your jaw, you will return to have an abutment placed. An abutment rests above the gum line and allows Dr. Astles to secure your restoration with unmatched strength. Once the gums heal around the abutment, you will return to our office for a final procedure. During your final visit, Dr. Astles will secure your permanent crown, bridge, or denture to the abutment, restoring the appearance and function of your smile. You can care for your new teeth using traditional oral hygiene routines. Implants provide incredible support for your restoration, so you can eat, speak, and smile with complete confidence. Dental implants not only offer functional and aesthetic benefits, they also help to preserve your oral health. To learn more about dental implants, reach out to our practice today.